After 134 years of baking bread, the Warburtons Bakery is moving into the snack market with two new ranges. The first is a baked pitta chip available in three flavours - Mature Cheddar & Spring Onion, Chilli Jack and Sea Salt & Malt Vinegar. These are called ChippidyDooDaa, a cool name and some pretty cool packaging too. The second range is a wholegrain snack called SnackaDoodle. It is available in Cheddar Cheese & Onion and Sweet Chilli. They are made from whole wheat, corn, rice, oat and barley and they are 60% less fat than standard potato crisps. Which is great news as far as I am concerned. I was sent a batch of these new snacks to try. Here are a few notes I took down as I was trying them. Crispy little triangles, in fact very crisp. Such a good idea turning pitta into crisps. Graham didn’t like these, he thought the cheese flavour was a bit artificial. He says they are not a crisp he would buy, but it they were sitting in a bowl on a table, he would happily eat them. More crispy little snacks. The flavour of these crisps really packs a punch. A much stronger flavour that the sweet chilli SnackaDoodles. These got a thumbs up from Graham who thought they were very crunchy and fairly spicy. On first bite I thought I could taste more of the pitta than the flavouring, but as I ate another and another, I decided I really liked that about them. Salt and vinegar crisps can be a bit too overpowering sometimes. Graham doesn’t usually choose salt and vinegar crisps, but he enjoyed these. These are puffed wheaty circles, with a lovely flavour of chilli. They have a slight sweetness, but not too strong a flavour. Graham took the bag off me to finish them. 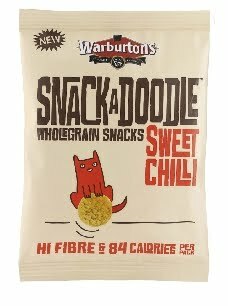 Funny enough, Mature Cheese & Spring Onion was be the flavour I would have picked up to try, but it looks like we will be buying those SnackaDoodle Sweet Chilli wheaty puffs for a snack and it's just an added bonus that they are low calorie too. They are Lucie, especially the chiili flavours.